As with all things portable, portable projection involves tradeoffs. Whether those trades are advantageous depends on what you’re after. There’s a pretty big difference between the kind of projector you’d take for a business presentation, and one you’d hand over for your kids to have fun for the evening. Those differences can have a huge impact on entertainment value, which is why it’s important to know your own expectations for selecting the right portable movie theater. 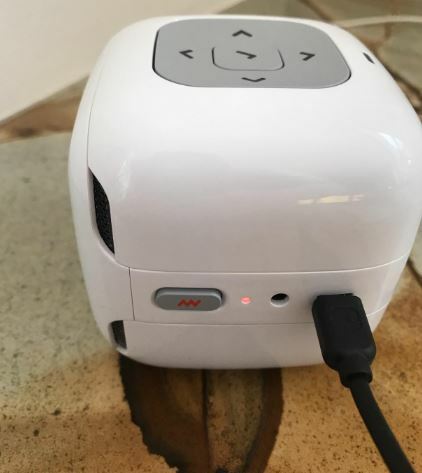 The Cinemood Portable Movie Theater is fairly unique with respect to its abilities, it’s a type of device best categorized somewhere between toy and tool. But on that spectrum it’s certainly tilted heavily on the side of being a toy that’s most obvious with its kid-friendly design. It’s also clear in the preloaded kid-friendly entertainment. But you don’t have to be a child to find entertainment inside the Cinemood Portable Movie Theater. 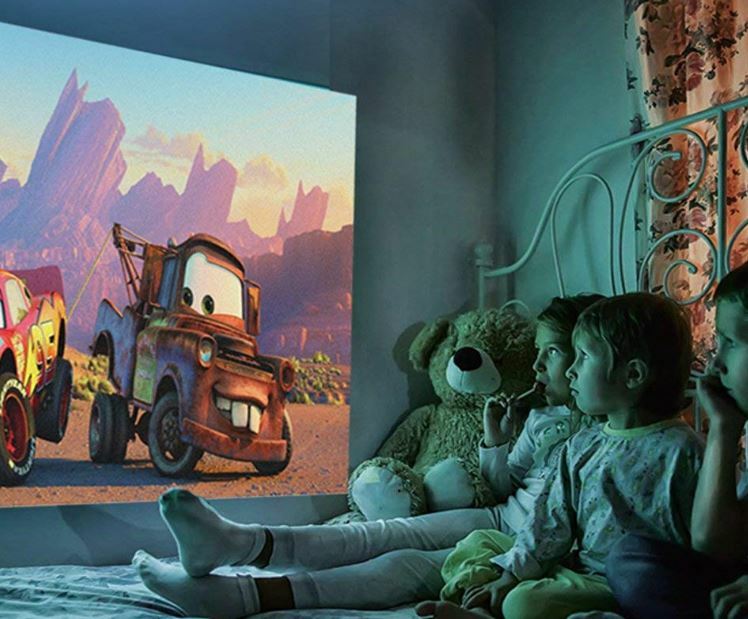 Living up to its name, you can connect to a variety of streaming services and watch essentially anything you want through this projector. From YouTube to Netflix, it’s fairly rare to see devices oriented towards children packed with so much powerful technology. Physically speaking, it’s easy to notice the pleasant symmetry of the Cinemood Portable Movie Theater. It stands 3.1 x 3.1 x 3.1-inches, a white cube large enough to fit neatly in the palm of your hand. Its edges are thoroughly rounded, so as to be without any stiff outer points of contact. And it has a hefty feel about it, weighing about eight ounces. Along its right-face, you’ll find a Micro USB port, which allows you play your own content through USB. Directly adjacent to that port is the primary power button. The button is somewhat intuitively labeled with a single lightning bolt. One thing to watch out for is how the button only requires you to press it half-way down to make a point of contact. You don’t want to accidentally nudge it during operation, or accidently press the side of the button while picking it up. In either case, you’re bound to accidentally turn-on or turn-off the Cinemood Portable Movie Theater. And accidentally turning it on can be perilous due to the somewhat dim nature of the bulb. You may not immediately notice you’ve accidentally turned it on even if projection begins. Those concerns are limited thanks to the addition of a feature that will eventually turn the projector off, but it can cause unwanted power drain if you’re careless. Although it’s quite small, given appropriate lighting conditions, the Cinemood Portable Movie Theater is quite powerful. It’s fully capable of a 150” image, which is somewhat astonishing considering the pocket-sized nature of this projector. But the key phrase there is: given appropriate lighting conditions. Without the right lighting, the Cinemood Portable Movie Theater faces serious issues, as we’ll see in a moment. Within such a small casing, and with a product that’s so clearly aimed at children, you may not expect much with respect to adjustable image options. But the Cinemood Portable Movie Theater provides more than you’d anticipate. For example, it has fairly effective motorized focus control. It’s allows you to keep the image clear without hassle, as it auto-corrects to help with visual distortion in an image. That means you don’t need to bring an adult into the room each and every time the projector gets moved. The bulb used by Cinemood has been made specifically to not strain children’s eyes or keep them up before bed. 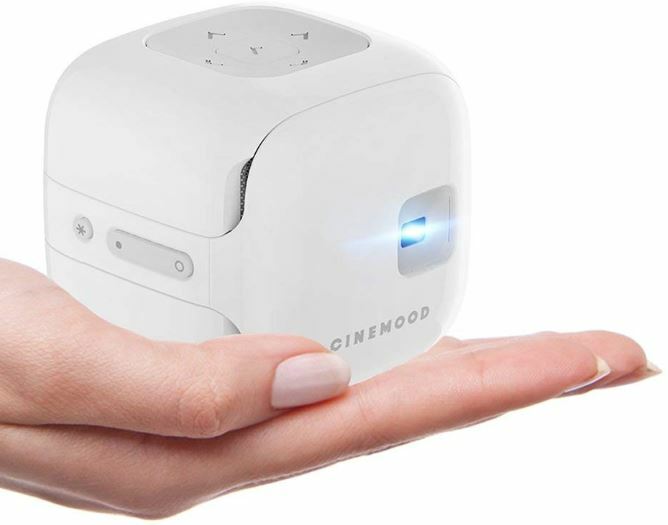 As a result, the Cinemood Portable Movie Theater projects a mere 35 lumens, which is about twice the strength of a night light. Dark rooms are an absolute necessity for using this portable movie theater. Even in rooms with modest amounts of lighting, the 35 lumen output will not be sufficient for projections larger than a few inches. One consequence of the child-friendly bulb is a surprisingly powerful 5-hour battery. Under normal circumstances, a 5-hour battery estimate for a projector of this size would sound far-fetched, to say the least. And projectors of this size usually end up with batteries in the range of 2-hours or less. But the Cinemood Portable Movie Theater manages to reach those heights because of its soft child-friendly bulb. Much of the added value of the Cinemood Portable Movie Theater originates from all of the content that comes preloaded within. Inside this miniature projector, CINEMOOD estimates they’ve added 120 hours of entertainment, stemming from audio stories, e-books, hand shadow puppets, lullabies, and nearly 100 cartoons. Among that preloaded entertainment, amongst which you’ll find 45 Disney eBooks, and nearly two dozen videos. Upon closer examination, the content isn’t terribly impressive, and much of it is slide-shows or still images. It shouldn’t be a major bearing on your decision to choose for or against the Cinemood Portable Movie Theater, but it’s a nice extra that can keep kids entertained if you find yourself unprepared and looking for something to in a pinch. Fortunately, the Cinemood Portable Movie Theater doesn’t rely on your appreciation of its preloaded content. It comes with 16GB internal memory, allowing you to load it with your own content. That’s enough for roughly ten full length movies played in 1080p. Even if you don’t want to carry around a USB drive, you can use the Cinemood Portable Movie Theater itself as a fairly effective way to haul around 25-hours of entertainment. Better still, you don’t have to be prepared as long as you’ve got an Internet connection. That’s because the Cinemood Portable Movie Theater can be used as a fully capable streaming center. It can handle YouTube, Amazon Video, Netflix, or even offline slideshows you put together. Unfortunately, there aren’t any onboard parental controls which you can use before handing it off to your kids. But you can make use of whatever parental controls you’re already using through those platforms. 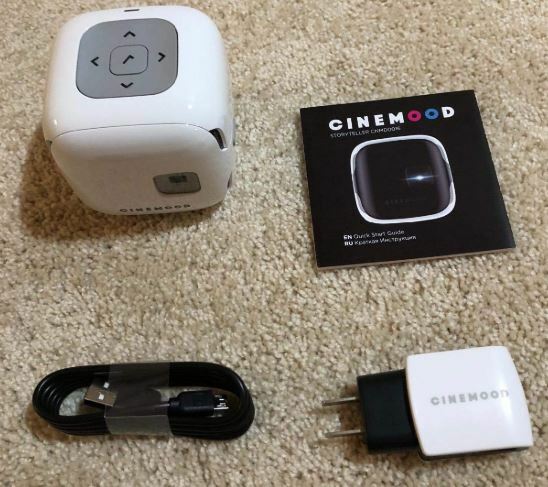 Connections are simple and wireless, as the Cinemood Portable Movie Theater is enabled for both Bluetooth and Wi-Fi. Although there’s no remote included, you can turn your mobile devices into a remote through the iOS and Android apps by which you can remotely control this projector. Both apps are free, and there’s further support options for controlling the projector through Apple Watch. Unfortunately, the small size of the Cinemood Portable Movie Theater means there’s a learning curve involved in operation. The first time you see it, it’s not even obvious how to power up the device. Orienting it upright can even be a challenge. But after a moment or two getting used to things, it becomes rather intuitive. Still, the graphical interface by which you navigate through the Cinemood Portable Movie Theater is underwhelming. It contains broken English in many places. While the menus are still intelligible, and doesn’t actually make using the interface any more difficult, these are the kind of small failures that reflect unprofessionally on a company. Generally speaking, the Cinemood’s smooth design is something you can feel safe handing over to kids. But the simplicity of its design does have some drawbacks. For one, it means there aren’t any mounting options for the Cinemood Portable Movie Theater. 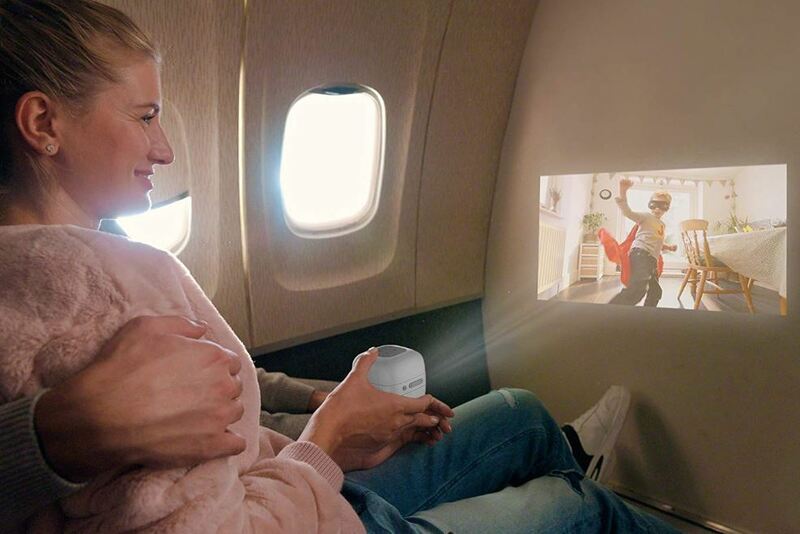 While all of the Cinemood Portable Movie Theater’s advertising features people holding the projector while playing with it, that’s just a terrible idea. If you’re going to watch something longer than ten seconds, you’re going to want the projector set on a stable surface. A flat desk or pile of books will do, but nothing beats being able to mount to a fixed surface. Another thing working strongly in favor of this projector is how Cinemood achieved noiseless cooling without the use of a fan. Nothing can ruin enjoyment of watching something like a noisy fan. And within small projectors you only find small fans; the noisiest variety of all. 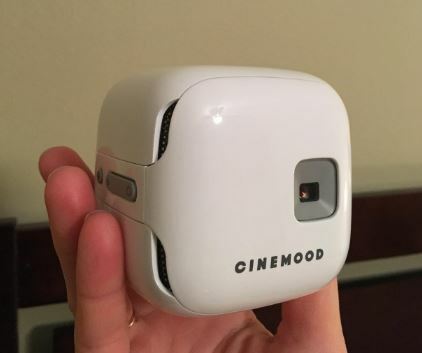 In spite of its fan-free design, the Cinemood Portable Movie Theater doesn’t run hot, largely thanks to its 35-lumen bulb. It does heat-up slightly during use, but once again, not to an extent you would be concerned about handing it over to kids. Depending on how involved you want to be with the Cinemood universe, you may find yourself avoiding some of its features. For example, if you find yourself investigating their app store, you’ll discover that you’re required to provide them with personal information and payment information. 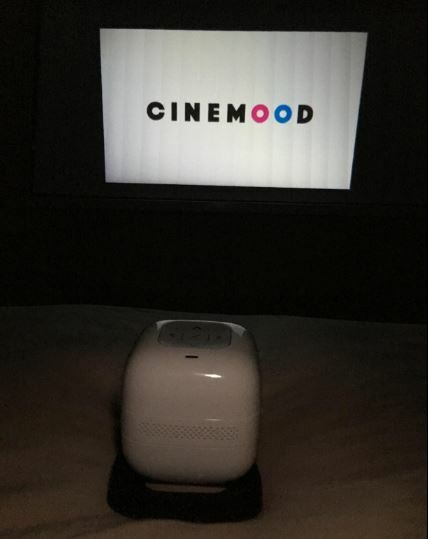 One thing you need to understand about the Cinemood Portable Movie Theater is that at 35-lumen bulb is going to require fairly dark conditions to operate. Closing the blinds on a sunny day isn’t going to cut it. That does mean the effective hours of operation for the Cinemood Portable Movie Theater are somewhat limited near bedtime. For people who don’t necessarily trust just any brand, that’s an unwelcome sight that will keep them away from those features of the Cinemood Portable Movie Theater altogether. But one thing that’s far easier to appreciate is Cinemood’s 30-day return policy, paired with a one-year warranty on their portable movie theater. Who Should Choose the Cinemood Portable Movie Theater? The Cinemood Portable Movie Theater isn’t about to replace your home theater. But relative to its size, and given dark conditions, it’s a fairly powerful little device. It’s not the best portable projector on the market, but it’s a strong choice in many circumstances. It can help busy parents on the almost endless quest of keeping their kids entertained, especially before bed, or while traveling on the road. Ultimately, these types of devices are about bringing family together. They can help you bring along a big screen anywhere you go, and keep everyone entertained as you spend time together. Although the preloaded content is somewhat underwhelming, the Cinemood Portable Movie Theater is a fairly formidable content streaming device. It’s a great choice road trips, camping, and just about anywhere else you might want to carry some movies with you.